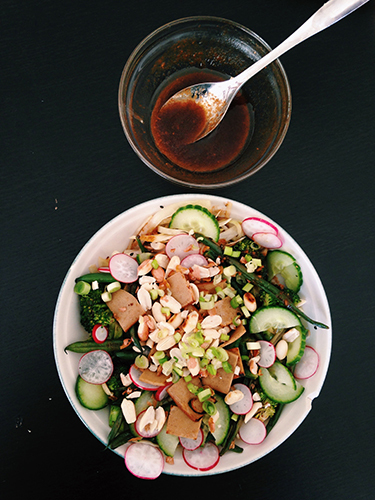 This warm, "mixed Asian cuisine" -inspired salad is a perfect lunch or a great, lighter dinner. It's nutritious and filling, but not at all heavy. The tamarind salad dressing is the trick here, though! My previous post was a bit picture-heavy, so this time I'm just posting a recipe I quickly wrote down while preparing lunch some time last spring. That's why, I have to warn you, the amounts of all the lovely veggies in the recipe for this salad are (somewhat) roughly estimated. As I just came across the first of the Finnish green beans this season, I'd say now is a pretty good moment to share this one! Mix all the ingredients in a cup. **Optional, but good for extra protein. I used small bits of smoky seitan, which I heated up on a pan right before serving! Start by rinsing the beans and bringing a pot of water to a boil, reduce the heat and cook the beans for about ten minutes, then strain and leave to dry a little. While the beans are boiling, chop the broccoli and celery. Cut the cabbage into thin slices, and in a separate bowl, mix the cabbage with the sesame seeds and grated ginger. Prepare your fresh veggies, too: I cut my cucumber, radish, and spring onion into thin slices. To roast the peanuts, heat up a dry pan and roll them around until you get a nice, golden brown color (watch out, though - I tend to burn mine more often than not...). After that, sauté the white cabbage gently and quickly, just to make it a little bit softer. Move the cabbage aside (or on your plate, where it belongs). Add some oil on the pan. Fry the broccoli until it softens up a little, add the celery, then season with umami powder and garlic powder. Fry a bit longer to get some color on the broccoli, and to soften up the celery. Now oil up the pan again, and add the green beans. Roll them around until they, again, get some color. Season with a pinch of salt and the lime juice. Pile everything on your plate, splash in the dressing, enjoy! Hey, it's a kind of a green salad.